Industrial companies, manufacturers, warehouses and similar organizations will often rely on the fire brigade for fire protection. This is however not always sufficient, as they need the fire extinguishing to start as soon as the fire has been detected. Manufacturers have production equipment that is vital to the company. Although the insurance company will carry the financial burden of rectifying the damages, it will not be without cost for the manufacturer. Replacing specialized machines can take months, leaving customers to seek alternative suppliers. To win back previous customers, who have become used to a new supplier and their products can be difficult and costly. Other business disruption such a laying off staff or pay them salary during down time, destroyed production support facilities, damaged corporate image etc. will also add to the challenges for the company. Warehouses will often have finished goods that has to be delivered to customers to maintain market position, or store irreplaceable valuable artefacts if it e.g. belongs to a museum. All this must be protected by providing immediate fire fighting. For a non-professional fire fighter to be able to use fire fighting equipment, it must be lightweight and easy to use, and at the same time not require a lot of technical knowledge. A Firexpress tank unit centrally located in the facility will offer great fire protection. If a fork lift or pallet jack is available, feet can be mounted on the unit so that it can be moved around. For larger facilities a tank unit can be built into a vehicle, e.g. a pick-up. If the fire fighting vehicle needs to be able to navigate off-road environments, one of the Firexpress ATVs would be a good choice as they can service both narrow pathways and unpaved terrain. 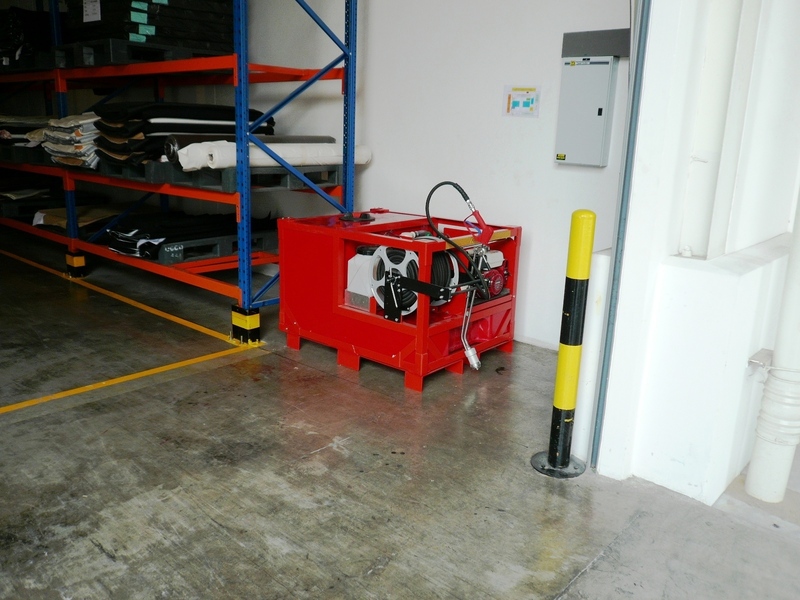 A trolley unit is very suitable for buildings that have a solid foundation on which the unit can be pushed. If a longer hose is needed, a mobile unit with transport kit and its 30m discharge hose is ideal. In some cases it is not possible to get to the fire scene with a fire fighting vehicle. In these situations the fire fighter has to carry the fire fighting equipment to the fire. The Firexpress fire fighting backpack is the best ergonomically solution, and leaves the hands of the fire fighter free for other tasks. 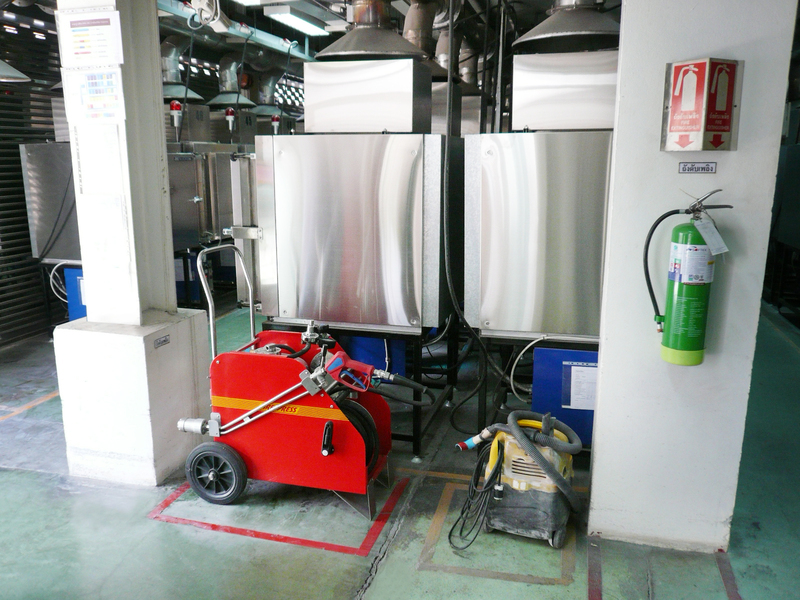 A 500 litre tank unit at the supplies warehouse of the Danish shoe manufacturer Ecco in Thailand. A mobile unit positioned in the furnace room of the jewellery manufacturer Pandora Production Co., Ltd.